On April 13, Associate Professor of art Wanda Raimundi-Ortiz will perform her Puerto Rican tribute, which draws from the island’s history and was inspired by the migration of Puerto Ricans to the U.S. after Hurricane Maria. If you attend Associate Professor Wanda Raimundi-Ortiz’s Exodus/Pilgrimage performance Saturday during UCF Celebrates the Arts, you’re likely to be entertained and inspired by the Puerto Rican tribute – but keep in mind the artist intends for the experience ultimately to educate. 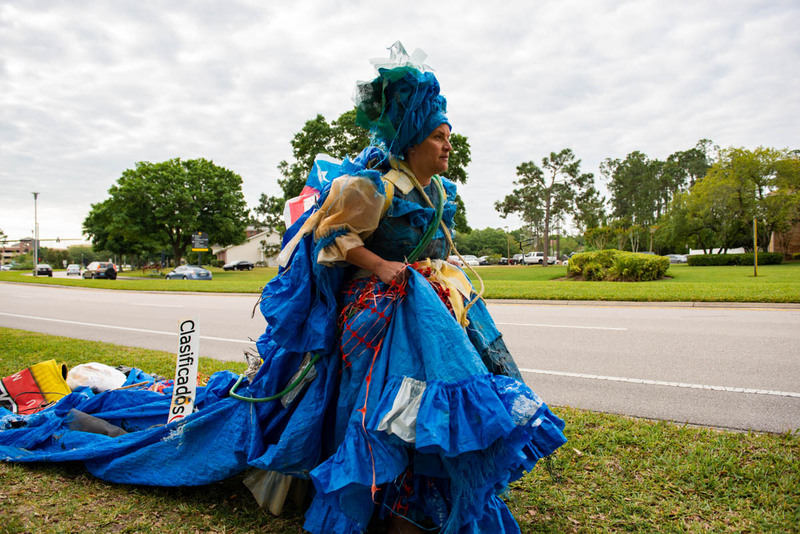 Starting at 5 p.m., Raimundi-Ortiz will lead a procession through downtown Orlando streets from the City Arts Factory to the Dr. Phillips Center for the Performing Arts in a gown made of debris collected from Puerto Rico after Hurricane Maria hit the island. Accompanying the performance artist on the mile-long journey will be plena players performing traditional folkloric music with handheld drums. Once inside the center’s DeVos Family Room, Raimundi-Ortiz will perform a dance to the beat of Afro-Puerto Rican bomba drummers. 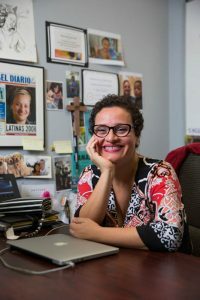 Although Raimundi-Ortiz, a New York native of Puerto Rican descent, has family on the island – including an uncle who’s never left the island — she was hesitant to see her fears about living conditions there confirmed when she visited. “It’s an island in the shadow of the United States. The hurricane only exacerbated that. Now almost two years later you have massive amounts of people who have moved to the United States just to survive,” Raimundi-Ortiz says. But in December, she faced her fears while visiting Puerto Rico to create the foundation of her performance. 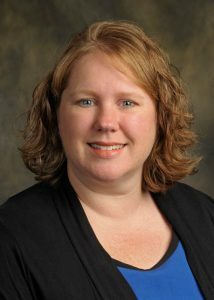 She was joined by Kristina Tollefson, an associate professor and costume designer in UCF’s theatre department. Aside from time spent researching and sketching, Tollefson spent about 50 hours constructing the traditional ruffle-style gown for Exodus/Pilgrimage. The two had worked together before on Raimundi-Ortiz’s Pieta performance in 2017, during which she acted as Michelangelo’s Mary and held 33 members of marginalized communities. While searching the island’s natural lands they found blue FEMA tarps, one partially buried on a beach, the other on a mountaintop, that help make up the base of the dress and represent the storm’s broad reach. Raimundi-Ortiz says it was beautiful being in coastal towns, but it was devasting to see house after house as barren husks. During three days they collected about 45 pounds of rain-soaked and sun-bleached children’s shoes and toys, signs from colmados (corner stores) and other items – the most surprising, Raimundi-Ortiz and Tollefson say, were sheets of salsa music. They were reminders of life and the importance of music to Puerto Ricans, another crucial element for the upcoming performance. The idea for a procession as a start to the performance reflects the influence of Catholic and Christian religions on Caribbean culture for people to “take to the streets” like they do in carnival, Raimundi-Ortiz says. Plena music derived from working-class Puerto Ricans who use handheld instruments and singing to communicate about current events through a periodico cantado, or sung newspaper. “It’s very much community activated. You have the person singing chants and another person comes back [with a chant] and the next person will call for next verse and the community will sing it back,” Raimundi-Ortiz says. Once Raimundi-Ortiz is inside Dr. Phillips, she will dance along to an all-female bomba drumming circle, a departure from tradition that dictates only men are allowed to touch the instruments. She wanted to utilize bomba, which is a call-and-response music and dance style, because it relates to the theme of forced migration and is rooted in Afro-Puerto Rican culture since African slaves created the music style as a form of communication. While thousands of Puerto Ricans are far from their homes and the ones still on the island are still struggling to piece their homeland back together, their strong spirit is a thread that ties them back to their roots.